I used to slip a little coupon code into every supplies order I ship, because I want to reward you for coming back and ordering from me again! However, I know how those little slips of paper get lost, and I get a lot of email asking "I lost the coupon code! Can you refund the coupon code?" Plus, I'm tired of making up a ton of slips of paper every month!! So I'm making this page to help you out, and also to spread the love for my new customers. $5 off orders over $50. Expires 4/30/2019. One time use per customer only. ONLY valid on this website. NOT VALID on custom orders. Cannot be used for orders already placed. Here's the caveat -- now that I have this code right here for all to see, I will NO LONGER be refunding any coupon amount after the order is placed. 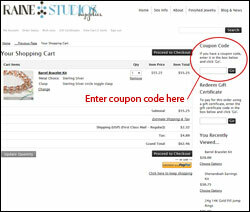 Coupon codes MUST be entered during checkout and cannot be applied after the order is placed. Coupon codes are ONLY valid here at rainestudios-supplies.com. By ordering a full troy ounce instead a partial troy ounce, you will already be getting a built in discount! With that being said, I do offer a discounting tier system for those ordering a mass quantity of rings. The above codes will not expire, and can be used as many times as needed. Please note that the discount will only be applied if the total of jump rings ordered by weight is over the total specified. You can order any weight, any metal, any size of jump ring and combine them any way you wish. The bulk discount does not apply for chainmaille kits, because putting together kits takes me more time to assemble them, therefore, do not qualify for a bulk discount coupon code. For example, if you purchase $70 worth of rings, and then $30 in kits, the BULK10 discount will NOT apply, because the total of jump rings by weight does not come to $100. As with the previous coupon codes - with this new policy I will NOT be refunding any coupon after the order is placed. Coupon codes MUST be entered during checkout and cannot be applied after the order is placed. Coupon codes are ONLY valid here at rainestudios-supplies.com. Please note that the policies stated on this page are subject to change without notice. Please feel free to contact me with any questions.